LONDON – Lisle Licensing has announced the appointment of RP2 Global as master toy partner for Bottersnikes & Gumbles in the UK, Eire and Australia. A range of innovative and fun toys capturing the humorous, distinctive and playful world of Bottersnikes & Gumbles, depicted in the multi award-winning series will include plastic and vinyl figures, feature plush and role play toys and will launch in the UK in Spring/Summer 2018. “We are delighted to have partnered with RP2 Global. They are an innovative group of people and we are looking forward to working with them to develop a fun toy line for this fantastic brand. Bottersnikes & Gumbles lends itself perfectly to the target audience of boys 4-9 and we can’t wait to see the toy line develop over the coming months”. LONDON – Leading kids’ entertainment specialist CAKE has reported a number of recent successes for its multi-award-winning hit series Bottersnikes & Gumbles. Bottersnikes & Gumbles was presented internationally at MIPJunior last month where it was extremely well received by buyers, becoming the second most viewed programme at the screenings. In addition, the CGI comedy series was awarded the 2016 Promax BDA Silver Award for ‘Best Program Title Sequence’ as well as receiving a further two nominations for ‘Best Music for Children’s Television’ at the 2016 Screen Music Awards and ‘Best Children’s Television Series’ at the 2016 AACTA Awards, both of which will be announced in November and December respectively. Earlier this year, Bottersnikes & Gumbles won the 2016 Pulcinella Award for ‘Best Kids TV Series’ at Cartoons on the Bay and the 2016 Gold AEAF Award for ‘Best Opening Titles’ as well as a nomination for ‘Most Outstanding Children’s Programme’ at the 2016 Logie Awards. 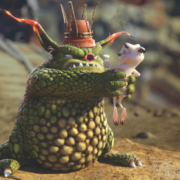 Bottersnikes & Gumbles – the award-winning kids’ CGI animation show – premieres on CBBC on 25 July 2016, airing at 6pm every week day. The series brings to screen the much-loved 1970s classic children’s books by Australian author S.A. Wakefield and illustrated by Desmond Digby. Each episode features the charming adventures of the loveable Gumbles as they endure timeless battles against the evil Bottersnikes in a forgotten valley of abandoned junk. LONDON –’Leading kids entertainment specialist CAKE and Australian production outfits Cheeky Little Media and Mighty Nice have signed a UK publishing deal with Hodder Children’s Books, for their new CGI children’s comedy series Bottersnikes & Gumbles. Hodder Children’s books, a division of the Hachette Children’s Group, will publish a series of young fiction and sticker and activity books aimed at 6-9 year olds based on the TV series, which is set to air on CBBC in July this year. Lisle International is the appointed agent for general licensing & merchandise categories. LONDON – Leading kids entertainment specialist CAKE and Australian production outfit Cheeky Little Media have announced the appointment of licensing and merchandising agents to represent their brand new animated production Bottersnikes and Gumbles. Lisle International in the UK & Eire (The Zelfs, Masha & The Bear, Temple Run, Tetris) and The Fusion Agency in Australia (Trolls, Dinotrux, Noddy, Kung Fu Panda, Where’s Wally, In the Night Garden, Driftwood Bay, Dr Seuss) will be responsible for seeking out partner licensees in all core categories. They will introduce the property to companies at the London & Nuremburg Toy Fairs at the end of this month. Copyright ©2018 All rights reserved. Lisle Licensing is a division of Creative Product Solutions Limited.